After Trump-Netanyahu Meeting: What Kind of One-State Solution? Abunimah is co-founder of the Electronic Intifada website. 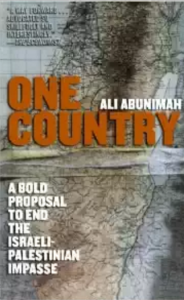 His books include One Country: A Bold Proposal to End the Israeli-Palestinian Impasse. He just wrote the piece “Trump-Netanyahu meeting lays ground for one-state solution,” which states: “U.S. President Donald Trump and Israeli Prime Minister Benjamin Netanyahu held a joint press conference at the White House on Wednesday morning, before going into their much-anticipated bilateral meeting. “Asked about whether the U.S. was still wedded to a two-state solution, Trump broke with longstanding orthodoxy. “Conventional opinion views any Trump abandonment of the two-state solution as capitulation to Israel’s far right wing that is pressuring Netanyahu from within his coalition to annex the West Bank outright. “The annexationists may hope that the Palestinians could eventually be pushed out, or forced to live under some form of Jordanian jurisdiction — the so-called Jordanian option. “That may even be the motivation of the anti-Palestinian extremists in the Trump administration, but the analysis fails to take into account the growing support amongst Palestinians for a democratic one-state solution. “Trump has at least acknowledged that Palestinians must agree to the terms of any agreement. And Palestinians will not submit voluntarily to Netanyahu’s conditions. “Israel could not just annex the West Bank on its own terms. Pressure would escalate — as it did on South Africa — to end openly declared apartheid. Indeed there could be no greater boost to the boycott, divestment and sanctions (BDS) movement. “Even the Israeli president recognizes this. Speaking at a conference on Monday, Reuven Rivlin argued for annexation of the West Bank, but said it must mean full citizenship for Palestinians.